Annuity income is under threat as investors seek the safe haven of bonds and gilts with the risk of a Brexit vote sending equity markets lower and the 15-year gilt yields to an all time low of 1.66% down 27 basis points. Fear over a Brexit vote with the EU Referendum next week has seen investors move their assets to safe havens such as Treasury Notes, German Bunds and UK government bonds. The 15-year gilt yields were as high as 2.10% at the beginning of may and have since reduced to an all time low of 1.63% before recovering to 1.66% a fall of 27 basis points in June. 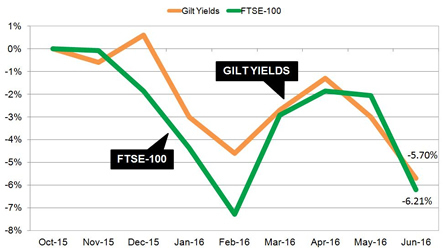 UK annuity rates are based mainly on the 15-year gilt yields and a 27 bass point decrease in yields would result in a 2.7% fall in rates at some time from providers. 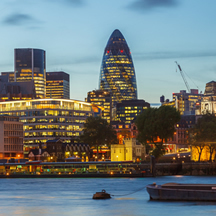 Equity markets have also reduced with the FTSE-100 index lower by 5.3% over the last week. many people retiring remain invested in equities before they purchase their annuities and this would reduce their annuity income. Uncertainty about the outcome of the EU Referendum has sent equity markets lower to 5,966 a fall of 335 points or 5.6% over the week. The above table shows how both yields and equities had recovered since reaching recent lows in February 2016. The closer than expected polls could result in a Brexit vote leading to a period of uncertainty for investors and a need to find secure homes for assets in the short term. It is likely volatility will continue for the rest of the month making it difficult for people retiring to have any certainty over the annuity income they can receive. For our benchmark of a person aged 65 years old with a fund of £100,000 buying a lifetime annuity on a single life, level basis could purchase an income of £5,217 pa a week ago. 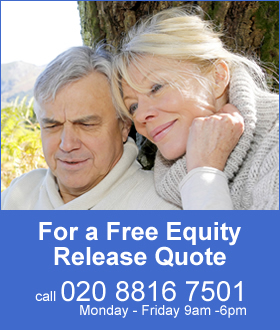 If they are invested in equities tracking the FTSE-100 index their fund would be lower by 5.6% reducing the the annuity income by £292 pa to £4,924 pa.
Over the lifetime of the annuitant and based on the Office of National Statistics (ONS) we would expect a male to live for 17.3 years and he will have £5,051 less over his lifetime. For a female she can expected to live for 20.4 years decreasing her income by £5,956.